Enhance driver's education in Michigan to include more "information concerning the laws pertaining to bicycles, motorcycles, and other vulnerable roadway users, including pedestrians, and shall emphasize awareness of their operation on the streets, roads, and highways of this state." PA 277 of 2018 was signed by Governor Snyder on June 29, 2018. It requires drivers education curriculum to include no less than one hour of classroom time devoted to laws pertaining to bicyclists, motorcyclists, and other vulnerable roadway users, including pedestrians. The laws of this state pertaining to bicyclists, motorcyclists, and other vulnerable roadway users shall also be incorporated to other parts of the drivers education curriculum where appropriate. (iv) Classroom instruction shall include not less than 1 hour of information concerning the laws pertaining to bicycles, motorcycles, and other vulnerable roadway users, including pedestrians, and shall emphasize awareness of their operation on the streets, roads, and highways of this state. The laws of this state pertaining to awareness of bicycles, motorcycles, and other vulnerable roadway users, including pedestrians, shall also be incorporated into other subject areas of the curriculum where appropriate. In Michigan, bicyclists are involved in less than 1% of traffic crashes, yet proportionally represent a much higher number of fatalities compared to other road users. This is because bicyclists are inherently more vulnerable when involved in a crash – lacking automobile safety features such as seat belts and air bags that have helped reduce auto-related deaths over the years. In 2013, 27 bicyclists were killed in Michigan, a 35% increase from 2012 according to the Office of Highway Safety Planning. Additionally, 1,479 bicyclists were injured during that timeframe. Furthermore, Michigan bicyclists often report being physically and verbally harassed by drivers. Sharing the road with bicyclists is one of the most common roadway in­teractions motorists encounter, and one that drivers frequently express confusion about. Currently driver’s education in Michigan spends a mere two hours on a module called Sharing the Road with Other Users. This includes not only sharing the road with bicyclists, but also pedestrians, motorcycles, mopeds, large vehicles, emergency vehicles, trains and public transportation, and construction vehicles and work zones. Only two hours of instruction for eight different categories does not leave adequate time to learn any of them in detail. Additionally, as innovative bicycle infrastructure continues to be installed as a result of Complete Streets improvements, it is imperative that our driver’s education curriculum keep up with these changes to ensure drivers know how to safely interact with an increasing number of cyclists using Michigan’s changing roadways. Encouraging and/or support revisions and updates to educational and training materials related to motor vehicle drivers that recognize multimodal transportation and new roadway designs intended to promote bicycle and pedestrian safety. 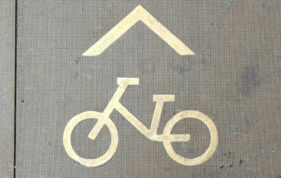 Other states have developed model bicycle safety curriculums. An evaluation of Utah’s Share the Road Driver’s Education Program showed that 76% of educators felt that the program increased student’s knowledge of safely sharing the road. The Michigan cycling community is dedicated to playing an active role in keeping our roadways safe, having already distributed over 360,000 copies of What Every Michigan Bicyclist Must Know, a handbook explaining bicyclists’ rights and responsibilities.